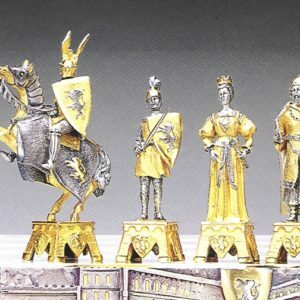 Charlemagne Luxury Chess Set, made in Gold and Silver and Bronze. Unique Luxury Chess Set, made in Bronze By lost wax process, finished using Real Gold 24 Karat and Silver. Each piece signed by the Sculptor Piero Benzoni. Chess Table made in Onyx and marble with the structure in bronze. (Stool not included). 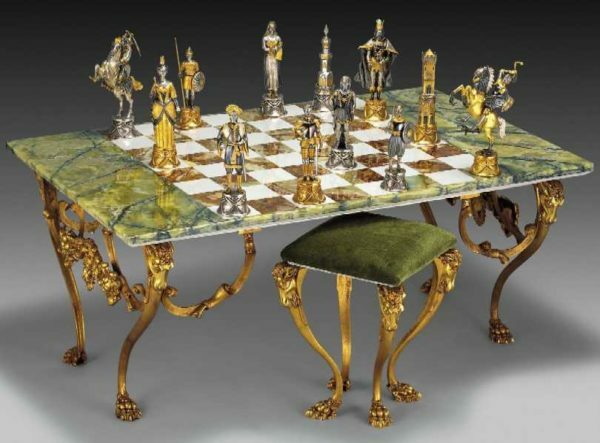 This one of the Most Expensive Chess sets in the World! Relive deed of Charlemagne (/ˈʃɑːrləmeɪn/) or Charles the Great (German: Karl der Große, Italian: Carlo Magno/Carlomagno; 2 April 742 – 28 January 814). He was King of the Franks from 768, King of the Lombards from 774, and Holy Roman Emperor from 800. He united much of western and central Europe during the Early Middle Ages. He was the first recognized emperor to rule from western Europe since the fall of the Western Roman Empire three centuries earlier. The expanded Frankish state that Charlemagne founded is called the Carolingian Empire. He was later canonized by Paschal III, whom Roman Catholics regard as an antipope Paschal III. Charlemagne was a model knight as one of the Nine Worthies who enjoyed an important legacy in European culture. One of the great medieval literary cycles, the Charlemagne cycle or the Matter of France, centres on his deeds—the Emperor with the Flowing Beard of Roland fame—and his historical commander of the border with Brittany, Roland, and the 12 paladins. These are analogous to, and inspired the myth of, the Knights of the Round Table of King Arthur’s court. Their tales constitute the first chansons de geste. 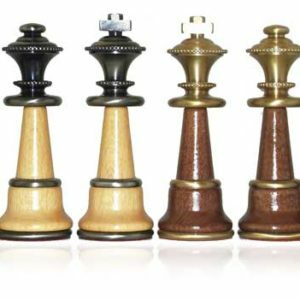 This beautiful and luxury and precious Italian chess set allow you to feel the pleasure of being a king, order it now!